Welcome to my Art Journal Share video today where I am sharing a video tutorial using my new very favorite paint color Golden's Quinacridone Magenta. It's a paint color that I have long admired but hesitated because it is pricey enough to buy. But it most certainly did not disappoint me! This art journal page uses a Donna Downey stencil La Rose which is a really beautiful stencil. I've had it in my stash for a wee while now and was nearly too afraid to use it, it's so pretty! As this is a very silly way of thinking I was determined to get the stencil covered in paint!. The darker background meant that I stenciled the rose in white first so that the lighter magenta would show up against the background. Sprinkling the Liquitex liquid acrylics against the background was the perfect touch to break up the darker page. Naturally the page was finished off with a found poem. I mean you really didn't expect me not to did you? Enjoy the video and be sure to subscribe to my youtube channel to stay up to date with all the goings on! Would you like to take a free class with me? Welcome to my Art Journal Share video today where I am sharing a video tutorial from the vaults today! It's an older journal spread but one that I am still very much in love with. We put all of this working into our art journals and then only share them once! Well I'm determined to change that for myself! This page uses a Stencil from Stencilgirl by Suzi Dennis called Spring Flower Vase. Even though this page is about a year old I am still in love with the way that it turned out, it's one of my favorites still even after all this time. 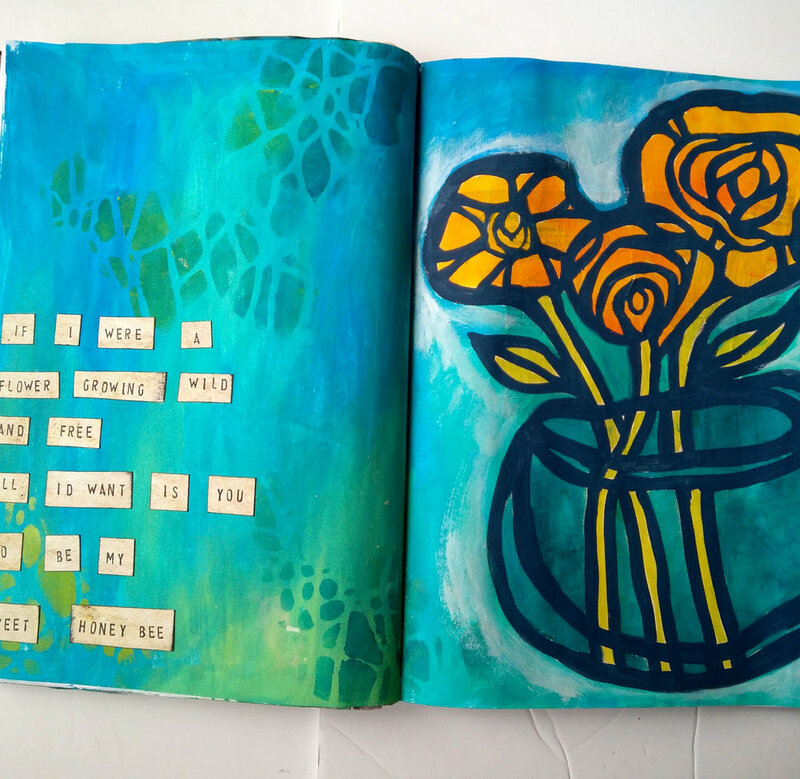 Using lyrics in my Art Journal pages is one of the things I most like to do when creating. They give me a wonder spring board for when I am stuck for ideas. I may hear a snippet of a song when I am out and about or one from a playlist might jump out at me. Once I have the song on my head the only way to get rid of it is to journal it out! I hope you enjoy the video, it is an older one so it looks a little different from some of my most recent ones. We all have to start somewhere though and I like to think my techniques have come on since then! Welcome to my Journal Share video today where I am making an abstract "Moon" themed page in my A5 Art Journal. This size is definitley one of my favourites to work in but that doesn't stop me from buying others of course! I use black gesso in this journal page which has to be one of my favorite supplies to work with. It's so beautifully black, matte and completely opaque. It gives a wonderful "tooth" to the art journal which means that so many mark making tools glide over it so easily. I most certainly took advantage of this by using my Gelli Roll Moonlight pens from Sakura and my most favorite Liquitex paint marker in White. I stenciled using the Shoreline Stencil from Stencilgirl by Rae Missigman. This is one of my favorite stencils to use, it's just so versatile. I am sure that when Rae designed it it was to represent the waves on the ocean but to me it just screams a pretty cloudscape which is how I have used it here in my art journal. I've used gold leaf on this journal page and it's a tricky substance to work with but it's definitely worth the patience. I've used it here with the Gilding Paste that comes with it but I have used matt medium and mod podge before I got hold of the paste so don't let that put you off. You simply "paint" the paste (it's really a liquid I have no idea why it's called a paste!) and then leave it to dry until it is shiny and tacky. This, for me, takes about ten to fifteen minutes. Then I used a dry paintbrush to pick up some gold leaf and brush it on. So without further ado the video of how I made this page is below, I hope that you enjoy watching the process!